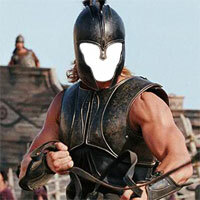 If you have been a big fan of Brad Pitt movies then you can now create your image in his character as in the Troy movie. The actor has been doing various roles and we are giving an opportunity to you get some fun amongst your friends. The photomica's "Face on the hole - Brad Pitt" will help you to create your own image by simply uploading your picture and adjusting your face on the hole in the Brad Pitt's costume. Then you can save the content, share it online on facebook.